Followed this creation a few days sgo. You have to hand it to him for ingenuity. 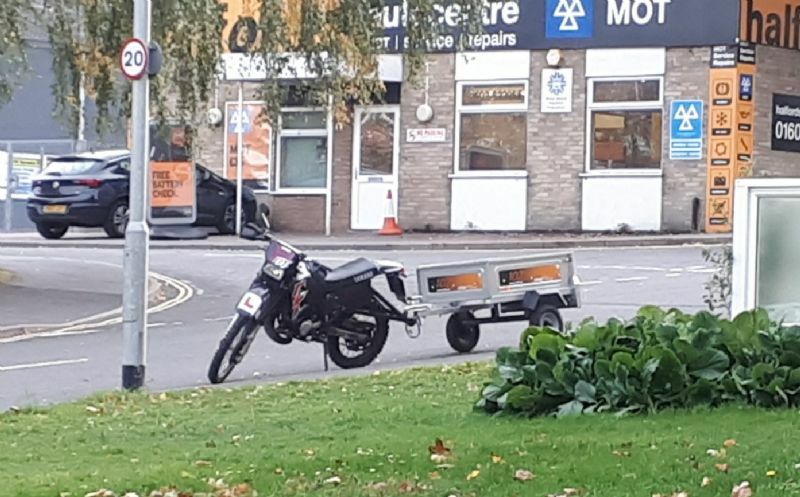 Lady that used to work in my local bike shop had a trailer on her triumph thunderbird for camping gear, transit van would of been smaller and is it legal with l plates? and is it legal with l plates? I'm sure it's not and given he (she) is a learner and is therefore likely to be quite young, even with a full licence won't have the trailer class on their licence without further training anyway - not like us old folks who got it as standard! I've taken advantage of the 7.5T class many times as well. It was all wired in and working properly but very much doubt its legal but then we are all naughty sometimes especially at that age. Thankfully Norwich is as flat as a pancake otherwise it wouldn't move haha.